"The stakes are getting higher." Andy is the Carus, "The Chosen" to the shifter world. Being the Chosen, however, does not make her life easy. Since she has multiple animals in her body, which is part of being the Carus, she found she has multiple mates. Her role also made her tempting to the Master Vampire who created a blood bond with her against her will. Now she has been removed from her job as an assassin for the SDR and made the Ambassador to the vampires. She doesn't want any of this, but she does want to survive and will do everything she can to ensure she does. As the Ambassador to the Vampires, Andy is present when they try to make a deal with the Demons. Things go south and a dangerous demon is on the loose, attacking and killing at random. Now Andy must stop the demon who is part of her painful past. The demon has taken over the body of her friend and neighbour Christopher. Andy doesn't want to kill him, but as the body count rises her choices become fewer and fewer. J.C. McKenzie has created a great series of stories about the Carus. CARPE DEMON has been so well written you can't wait for the next one. The characters are solid and Andy handles the multiple guy problem better than most. 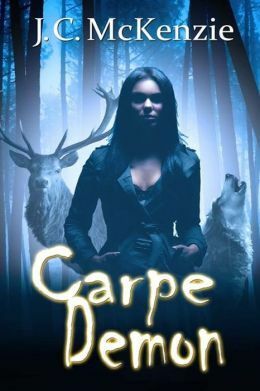 CARPE DEMON ends on a shocking scene that makes the reader reevaluate whether they are on Team Tristin or Team Wick. I love this series and can't wait for more. As an ambassador with the Supernatural Regulatory Division, Andy McNeilly is responsible for acting as the Liaison for the Vancouver Vampire horde. The problem? She detests the Vampire Master, and the SRD can't discover the beast she keeps locked inside. Threatened by the Master Vampire to deal with the Demon, Andy's complicated personal life doesn't make things easier. She's willing to risk her life and pride to keep loved ones safe. But how can she make a choice that will break one heart...and complete another? Re: The stakes are getting higher.